Micro Brow Pencil is rated 4.5 out of 5 by 388. Rated 5 out of 5 by Ali4421 from Won’t ever switch! Finally a color that matches and at a price point i can afford! It’s the only one close enough to the Anastasia pencil that I love! Rated 5 out of 5 by KristinAsh from My favorite brow pencil Made the switch from brow wiz to this, repurchased this over and over. Rated 5 out of 5 by Estherjj0 from Great Product! I bought the microbrow pencil about a month ago and im still using it! It is so good and I buy this product everytime. I just cant get enough of this product! Rated 5 out of 5 by sarahbear33 from Perfect match As a natural redhead it is so hard to find eyebrow pencils/pomades to match my hair color. I chose the color auburn and it matches perfectly! Rated 5 out of 5 by Kayleigh7 from Amazing! I have very thin, light colored eyebrow hair, and this pencil is amazing for either a natural brow or a full on different shape! Love it!! Rated 1 out of 5 by Annoyed Customer from Poor color The box and the color of the pencil did not match although it said they were the same. I can’t use it. How do i know when i have finished this product? Why does it make the clicking sound when i twist it and the product wont come out any more farther then the tip? Hey there hernandez2115! Thank you for asking about our Micro Brow Pencil. When you hear the clickign sound, it means that there is no more product left. We hope this helps! Which color is closest to the SOFT BROWN in other NYX brow products? Hey DiscoverWithDani! If you are looking for a shade that looks like a soft brown we recommend checking out the shade Ash Brown in our Micro Brow Pencil. We hope you get the chance to try it and love it as much as we do :)! Hey Bbrendaaz! We would love to assist you with your inquiry. Our best recommendation would be the Micro Brow Pencil in Espresso, which is a deep brown, or Black which is a brown/black shade. We hope this helps! I am shade 3 in precisely my brow pencil and was wanting a cheaper alternative. What shade would you recommend? Hi pbraz16! We noticed you are contacting us from Australia and you have reached the US page. 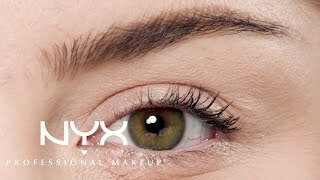 Our products do vary from country to country so in order to give you the best advice on products local to you, please visit https://www.facebook.com/nyxcosmeticsaustralia/ We hope this helps! Hi, I have dark brown hair and very dark (also brown) eyebrows, what color should I pick if I want a more natural look? I barely use any makeup so I would like a color that I can use every day but still get that &quot;no makeup look&quot; with. Hi Blair! Take a look at the shades Espresso or Brunette for a close match. We hope this helps! What gel color goes along with the ash brown pencil color? Hi! Is this pencil waterproof? Hi JanelleLovely! This product does not claim to be waterproof. Thanks for your question.